The recently completed, modern and comfortable accommodations are located spread out over the spacious Noordzee Residence Cadzand-Bad. There is a choice of various types. There is a 5 person terraced apartment (NL-4506-24). These are located in rows of three and is the middle unit. The three various units are accessible via a communal hall, but all have their own front doors. There is also a 6 person detached variant with a sauna (NL-4506-25). This villa has a bedroom and a bathroom on the ground floor. There is also a charming 13-pers. villa (NL-4506-26). This consists of a total row of three, of which NL-4506-24 is a part. You then have a choice of three kitchens and three living room/diners. The ground floors of the units are connected by doors. Ideal for a group travelling together or for multiple families going on holiday together, all together, but with your own space. 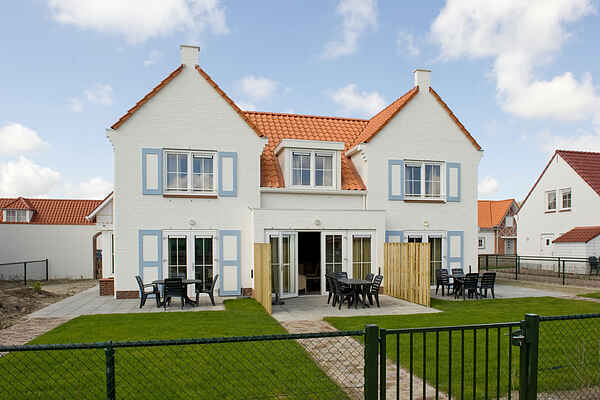 All houses have a garden with terrace and garden furniture.